The rain we received Friday evening wasn’t as wide spread as we first thought. We were able to plant part of the Stapleton farm last night and are currently planting in the Heyworth area. Here are some more links to planting videos ( http://www.youtube.com/watch?v=HoenjlPgONg ) and ( http://www.youtube.com/watch?v=iJdwqip9OzQ ). This past weekend we celebrated grandson Reid’s first birthday with a party here at the farm. 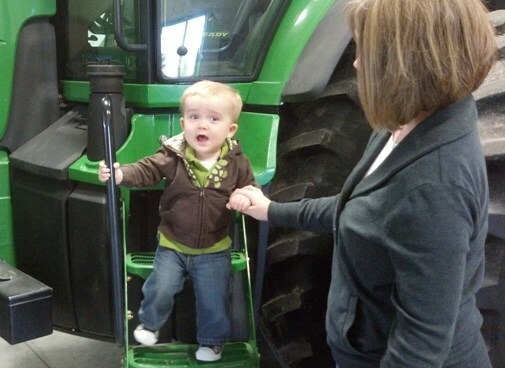 He also had his first tractor experience, as can be seen in the picture. His feet don’t quite reach the pedals but he sure knows how to work the horn! 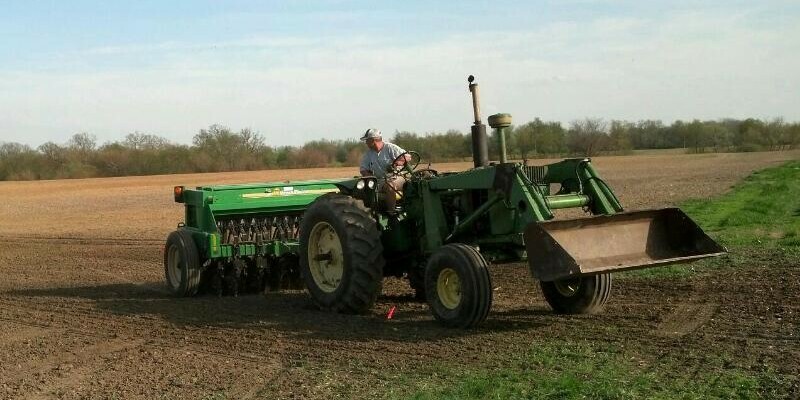 It finally dried out enough to plant corn and we got started on Tuesday afternoon. Last night we were rained out at around 6:30 by a thunderstorm that left us with 4 tenths of an inch. 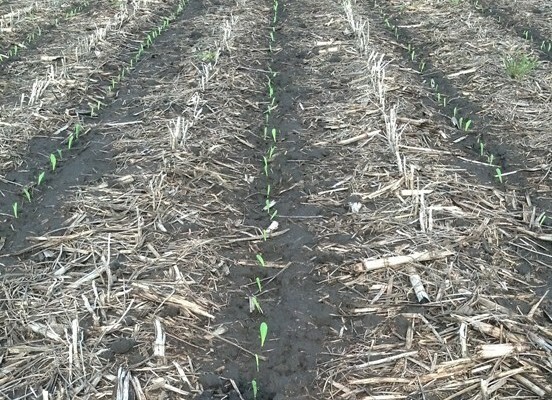 Planting conditions were already plenty wet, as can be seen in the pictures and the following video ( http://www.youtube.com/watch?v=bAaGomuYDm0 ). It looks like we will be out for a couple days but the rain was just what the doctor ordered for the corn we were able to get in. We also resorted to some redneck engineering this week, equipping the sprayer with some wider tires to handle the wet spring. A set of used wheel spacers for an old John Deere four wheel drive, the tires off of the grain cart, and couple hours of work added quite a bit of flotation to the Apache. Spring Weather Arrives, and then goes…. We finally had a short spell of warm dry weather this week. It dried enough to get some rebuilt waterways seeded and level some more tile lines that were put in in March. The total rainfall received for the month of April was 6.05 inches. The rainy weather has set in again and there is already 6 tenths in the gauge this morning.